The top street of this village is the horrible road from Woodbridge to Aldeburgh and Orford, but once you get down into the valley it is a surprisingly lovely and peaceful place, a twin to Ufford, across the river Deben. 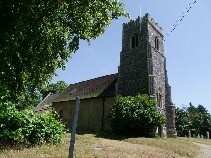 The church is down a quiet lane, on a mound, suggesting an ancient site. 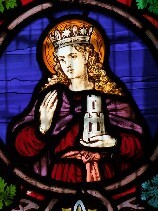 It is dedicated to the patron saint of East Anglia. I first visited this church on New Years Day 2000, and was pleased to be the first of the new century to sign the visitors book. In fact, this church has few visitors. 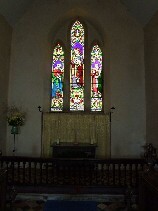 Possibly because it is hidden from view; and, perhaps, that it has none of the glories of its near neighbour Ufford. This is a pity, because it is a rather lovely little church, with some interesting features. 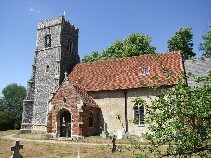 The tower is typically East Anglian 15th century, but not large. The tower was built in the 1450s and 1460s, and has a curious little pyramid on top of it, that may be an 18th century embellishment. The most striking thing as you approach is that there are hardly any windows in the north wall of the nave. A strange brick course extends upwards from the blocked north door. 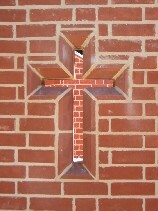 It is the outside wall of a chimney flue. An unusual modern vestry adjoins the 19th century chancel. I am told that, when it was built, a number of skeletons were found; but, because this is the north side of the church, and those in charge thought them either suicides or the unbaptised, they were reburied without ceremony. 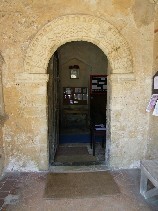 The south porch is a handsome red brick affiar, and it shelters a Norman doorway. 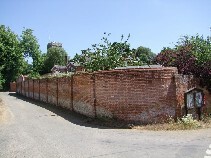 It is rather primitive compared with those further north in East Anglia, but an unusual survival in this area where so many churches were almost completely rebuilt. 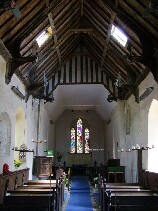 The interior, however, is almost entirely Victorian, strikingly narrow under a high pitched roof. The Victorian skylights at the east end make up for the lack of windows. 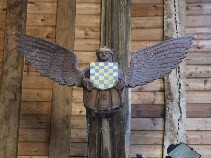 The angels are mostly fibreglass copies of the two at the far east. 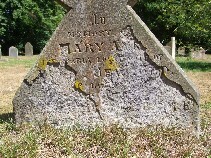 These were carved in the 1920s by the carpenter-vicar of Eyke, the Reverend Darling. 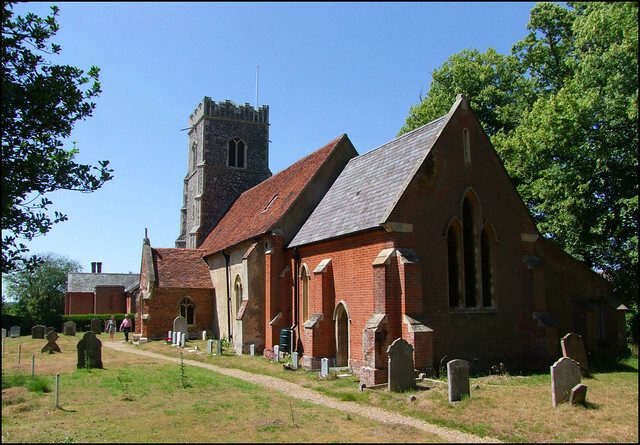 The story goes that they were originally made for the church at Rendlesham, but turned out to be the wrong scale, so were presented to this church instead. 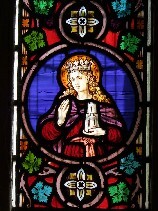 You can see much more of his work in his own church. The angels carry shields, and a key to these is on the wall. 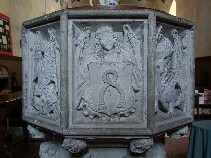 The late medieval font also carries the iconography of power: this time, of church and state. 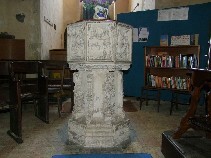 Behind the font, below the tower, there are two curious holes about two metres from the floor, one in the south wall and one in the north. The one in the south has a 12th century head below it; although shallow, it looks as though it might have been a decorated corbel of some kind. The holes are about 15cm square, and go back a long way into the wall. The packing at the far end suggests that they might once have gone through to the outside.If they were directly opposite each other, you would instantly guess that they had held the two ends of a beam, perhaps supporting a floor. But they are not. Mortlock thought they might have been squints, but it is hard to think this likely. 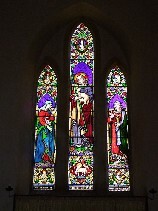 The chancel windows are memorials to the King family, who provided vicars here throughout the 19th century. 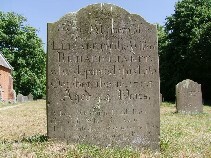 There are still modern King graves in the churchyard. The greatest treasure of this church is not generally available to see. This is the famous Mechlin bell. This bell is decorated with two scenes of rosary mysteries, the Annunciation and the Presentation, as well as the flight into Egypt, and St Michael confronting a dragon. On it, in old Flemish, is written Jesus am I, cast by Cornelis Waghevens in the year of Our Lord 1530. 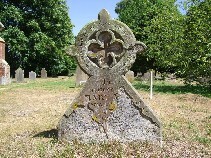 When I first came this way ten years ago, I was intrigued to find out if it was still in situ. Cautley saw the bell during his 1930s survey, but I could find no mention of it in modern guides. Did it still exist? Had something forced its removal and possible loss during the intervening 70 years? Fortunately, after I first uplinked this page, two very kind people from St Edmund contacted me, to not only reassure me that the bell still existed, but offering to show it to me. I was very excited; although I have no head for heights, the inside of church towers always fascinate me. Also, the Mechlin bell is a major medieval art object; I would certainly go and see it if it was in the V&A, so here was a chance not to be missed. We climbed the winding stair, the steps renewed since the tower was built, presumably at the Victorian restoration. When we reached the floor of the bell chamber, there was another surprise in store. A crumpled length of dusty metal turned out to be, on inspection, an old decalogue board. It was one of a pair, the other now vanished. These boards listed the Ten Commandments, and often the Creed and Our Father as well. 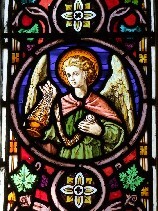 They were found at the east end of every Anglican church throughout the 17th, 18th and 19th centuries; some still survive there today. 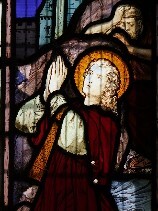 This particular board was an enamelled zinc sheet, commonly found in Suffolk, but more often transferred to the west wall after the influence of the Oxford Movement had encouraged a more sacramental approach to worship. 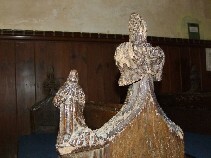 The wooden base of this sheet stood beside it, and was presumably removed from the chancel at the time the King family led a makeover in the 1870s. But on we went, up a narrow ladder, on to the medieval bell-frame. This frame of narrow planks sits about 15 feet above the bell-chamber floor, perhaps 50 feet above ground. I balanced myself precariously on a timber to examine the gorgeous bell. 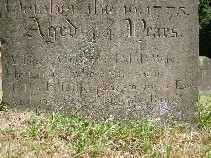 The side I'd climbed features the Annunciation panel, and the end of the inscription, including the date. You can see the photographs above - taken, I am afraid, in pre-digital days. I 'm afraid that my nervousness prevented me climbing across the bell frame to photograph the other side, but what I'd seen delighted me. 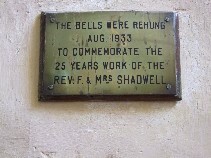 The bell frame contains two bells, although the tower contains space for a third. There was only space for two when Cautley saw them in the early 1930s, before they were rehung. The other bell is perhaps 200 years older than the Mechlin bell, but it is, unfortunately, cracked. 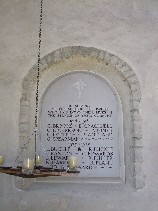 Cautley deciphered a request for St Paul to pray for us, in Lombardic script.